A TSP App By Late 2013? The Thrift Savings Plan has changed a lot over the past ten years. In 2002, it expanded the number of funds from three to five, and a few years later it created a series of lifecycle funds. Also in 2002, the TSP opened to uniformed service personnel, and participation subsequently expanded by 50% over the next ten years. 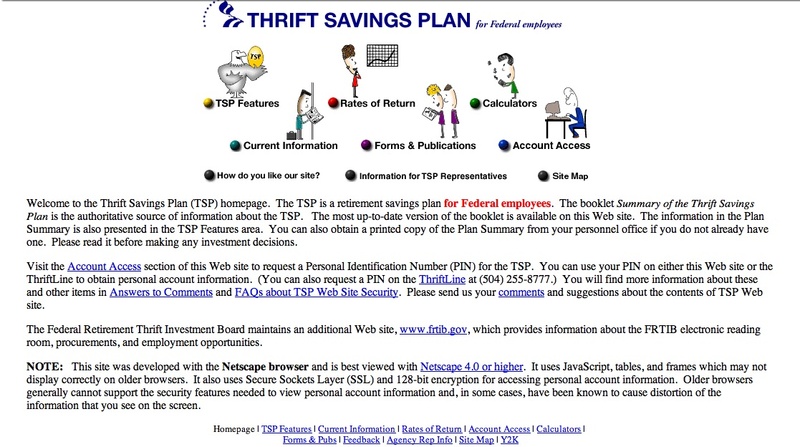 That same year, the TSP Web site began to post the daily closing prices for each of the funds, and participants eventually were able to request interfund transfers online with the expectation that the requests would be completed within a day or two. More recently, the TSP initiated automatic enrollment, and participants could begin to contribute to their TSP accounts almost immediately upon being hired. This was a huge improvement over the 1990s-era TSP. New employees had to wait six months or more for an “open season” to begin to contribute to their TSP accounts. Interfund transfers could only be requested once a month, and the requests would only be completed at the end of the month if the requests were received by the 15th. Participants had to sign an “Acknowledgement of Risk” form before investing in the C and F Funds, and this had to be completed before requesting an interfund transfer. Percentages, moreover, had to be stated in 5% increments. While interfund transfer requests (and acknowledgement of risk forms) could be completed on the TSP Web site, the site otherwise was bare-bones (see below). Now, TSP administrators are laying the groundwork for future innovations, and can be found in the Statement of Work (SOW) for “Technology and Enterprise Support Services acquisition” (TESS). The purpose of the TESS is to “competitively select a company to provide a broad range of information technology (IT) support services” beginning in FY2014. At 200 pages, it is a dense read, but it lays out how the TSP will look in the coming years. These end-user apps are not guaranteed, however, since this section addresses “support for FRTIB [Federal Retirement Thrift Investment Board] and potentially user owned devices” (my emphasis added). I think it’s safe to say that it is not a matter of if there will be a TSP app for mobile devices, but when. The “when” is addressed in an accompanying powerpoint slidedeck, posted late last week. According to slide 24, now that the SOW has been drafted, the formal “Request for Proposals” will be issued in mid-December, and the contract will be awarded by September next year. The new period of performance will begin from October 1 next year. Perhaps by that point, TSP participants will learn more about possible new services, to include mobile apps. Separately, the FRTIB makes some interesting projections over the next five years (slide 16). It projects, for example, that participants could grow from the current 4.6 million to upwards of 7.2 million by 2017 (this number would most likely include retirees leaving their money in the TSP, new employee participants between now and then, and greater participation among military personnel). It also projects that assets could grow to $546 billion from today’s $321 billion. The FRTIB notes the possible implementation of the mutual fund window and of an automatic deferral escalation. And to manage the expansion of services and growth in assets, the FRTIB projects an almost doubling of agency employees to 200, from 110 currently.